Quapaw elder Ardina Moore recounting traditional narratives to AAS crew members. The Arkansas Archeological Survey (ARAS) has a long history of cooperation with Caddos, Cherokees, Osages, Quapaws, Tunicas, and other Native American communities who made important contributions to Arkansas history. The scope of these relationships expanded significantly with the passage in 1990 of the Native American Graves Protection and Repatriation Act (NAGPRA). Former ARAS Director Thomas J. Green co-authored (with Jerome Rose and Victoria Green) “NAGPRA is Forever: Osteology and the Repatriation of Skeletons,” a clarion call, published in the 1996 volume of Annual Review of Anthropology, for archeologists and physical anthropologists to take seriously their responsibilities to work closely with descendant communities. 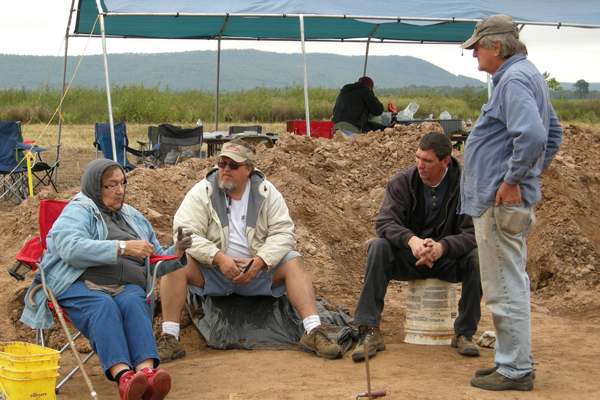 Up to the publication of that essay, ARAS professional staff interactions with Native Americans mostly involved consultation, reaching out to officials or other representatives to provide information about ongoing or prospective archeological projects and seeking advice on research topics, procedures, and information sharing protocols, typically accompanied by invitations to visit field or lab operations in progress. Two projects undertaken by ARAS staff during the early years of the 21st century mark an important transition in these relationships, involving a shift from consultation to collaboration—the active participation of Native Americans in all phases of an archeological project. Osage Tribal Historic Preservation Officer Dr. Andrea Hunter (right) and assistant June Carpenter (left) documenting Carden Bottoms vessels at the National Museum of the American Indian. 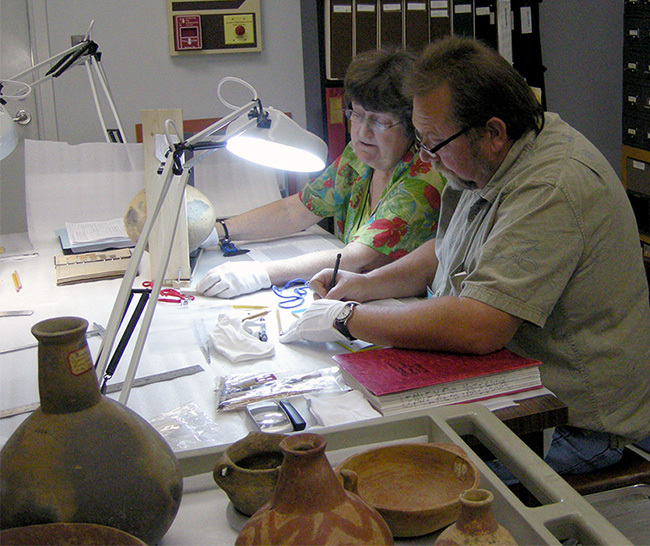 State Archeologist Dr. Ann Early and Caddo Tribal Historic Preservation Officer Robert Cast documenting Carden Bottoms vessels at the Gilcrease Museum. John Berry (behind Jess McKibben) holding eagle feather fan and giving a cedar smoke blessing to archeologists and Quapaws at Wallace Bottom, November 2003. Throughout the 1990s, Dr. John H. House of the ARAS-UAPB research station conducted investigations of contact-era sites along the lower Arkansas River. In the fall of 1997, the National Park Service created the Arkansas Post National Memorial to help preserve some of those sites, including the Menard-Hodges site, long considered an important settlement associated with late seventeenth century interactions between the Quapaws and early French explorers and colonists. House’s investigations added other sites, including Lake Dumond, which eventually also became part of the National Memorial. 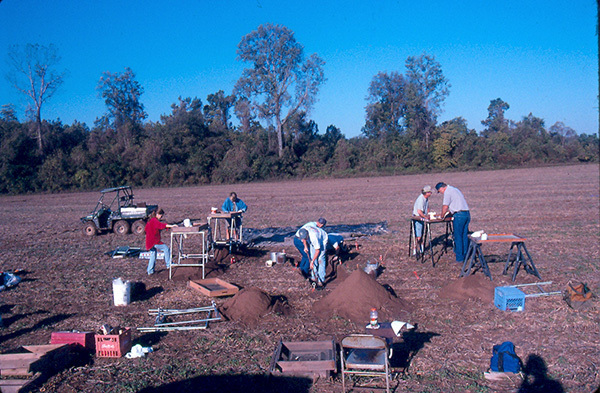 House directed 1997 and 1998 Arkansas Archeological Society training program excavations at Menard-Hodges and Lake Dumond, during which another nearby site—Wallace Bottom—was found to contain both Native American and French colonial artifacts. Encouraged by leaders of the modern Quapaw Tribe of Oklahoma, further investigations—including a remote sensing survey led by University of Arkansas Professor Kenneth Kvamme, followed by archeological testing and study of historic documents and maps—provided evidence suggesting that Wallace Bottom represents the Quapaw village of Osotouy, which hosted the first Arkansas Post established by the French in 1686. 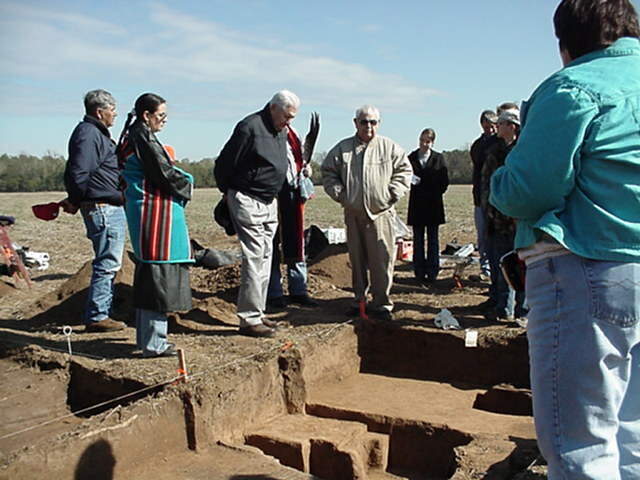 The Quapaw Tribe in 2002 received a historic preservation grant from the National Park Service to fund additional fieldwork at Wallace Bottom, including more remote sensing by Dr. Jami Lockhart (the ARAS Computer Services Program coordinator and director of Archeogeophysical and GIS applications) to expand the identification of buried cultural features. This project—titled “Cooperation Then and Now”—also supported targeted excavations directed by House that included participation by members of the Arkansas Archeological Survey, the Arkansas Archeological Society, and the Quapaw Tribe. Analysis of the data acquired through this collaborative effort yielded our best current approximation of colonial era Quapaw material culture (House 2013). House and Quapaw partners continue their collaboration on colonial interactions and the material identity of early Quapaw communities. Quapaw community members screening for artifacts at Carden Bottoms. As House’s investigations proceeded, another opportunity for collaboration presented itself with plans for investigation of the residential portion of the Carden Bottoms site, infamously known as the location of extensive looting during the early 20th century, when thousands of whole ceramic vessels and other items were exhumed from the site’s cemetery area. Hundreds of vessels attributed to Carden Bottoms are curated at several institutions, with the largest collections housed at the University of Arkansas, the Gilcrease Museum in Tulsa, and the National Museum of the American Indian in Washington, D.C. An intriguing feature of those collections is the representation of several distinctive pottery-making traditions, associated not only with the Carden Bottoms locality along the Arkansas River but also with the Central Mississippi Valley in eastern Arkansas and the Ouachita Valley in the southwestern part of the state. Most of these items are associated with the Protohistoric era (ca. AD 1500–1700), when the first encounters with European explorers took place. Wallace Bottom excavation in progress. George Sabo III, then ARAS research station archeologist at the University of Arkansas, initiated project planning, building in part from preliminary investigations by ARAS-ATU (Arkansas Tech University) research station archeologist Dr. Leslie C. Stewart-Abernathy. Sabo and Jami Lockhart sketched an initial plan to locate and identify residential features at the site. Inspired by House’s efforts, this was followed by a series of planning meetings involving Caddo, Osage, and Quapaw representatives to develop a framework to incorporate their perspectives along with those of conventional archeological science. 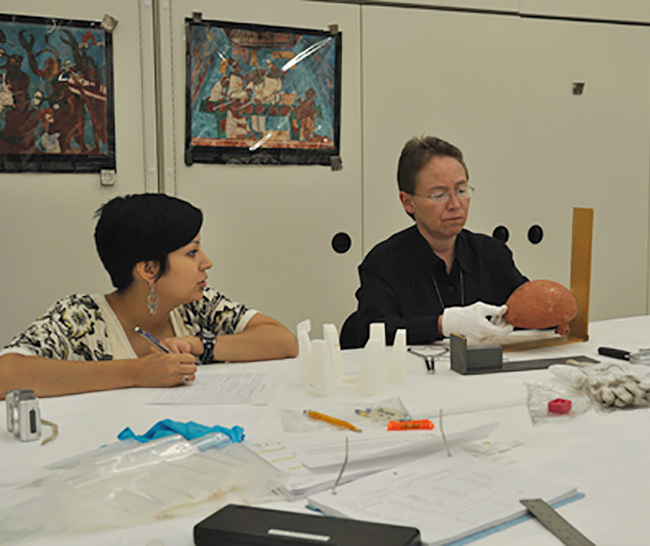 A research design was developed and a grant proposal submitted to the National Endowment for the Humanities (NEH), with Sabo, Lockhart, and Dr. Andrea Hunter (Tribal Historic Preservation Officer for the Osage Nation) as Co-Principal Investigators. 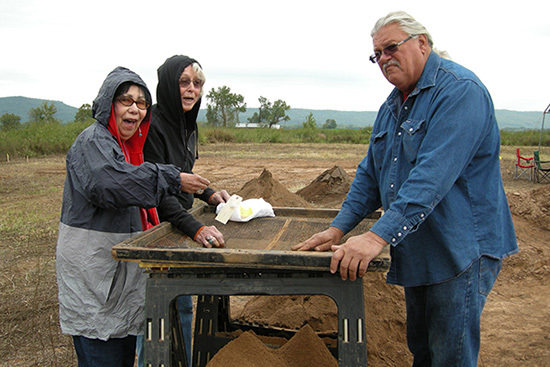 NEH offered significant funding for a three-year excavation program from 2009–2012. Members of the Arkansas Archeological Survey, the Arkansas Archeological Society, and the Caddo, Osage, and Quapaw communities participated in the fieldwork, including the excavation of three early 17th century dwellings and associated refuse deposits. Two Ph.D. dissertations have been completed by former graduate studies participating in the project, and additional studies continue. Project findings are adding important new information on the responses of Arkansas Native Americans to the tumultuous events of the early colonial era. 2013 Native American Material Culture from the Wallace Bottom Site: Southeastern Arkansas. Southeastern Archaeology 32(1):54–60. 1996 NAGPRA is Forever: Osteology and the Repatriation of Skeletons. Annual Review of Anthropology 25:81–103.